WANI, Indonesia (AP) — The captain and crew sailing the Sabuk Nusantara ferry to new owners on the Indonesian island of Sulawesi got the task done and then some. The hulking red and yellow ship was bounced like a basketball as a massive earthquake rocked the region and it landed in front of a row of houses in the village of Wani, dumped by tsunami waves that the crew say were a towering 15 meters (50 feet) or higher. A week after the magnitude 7.5 quake and tsunami hit central Sulawesi, the captain and 20 crew of the ferry remain on board, waiting for an assessment team to arrive and decide if the ship, its propeller jutting over the waterfront, can be put back to sea. In interviews on the bridge, the captain, second-in-command and petty officer recounted minutes of chaos and sheer panic as at least 10 other vessels twisted and collided and the rapidly retreating tide — a sure sign a tsunami is coming — sucked the Sabuk Nusantara away from the pier. “It was just sudden,” said the vessel’s second-in-command, Jona Johanes. “We felt the ship was like a basketball being bounced” as the quake rocked the region. 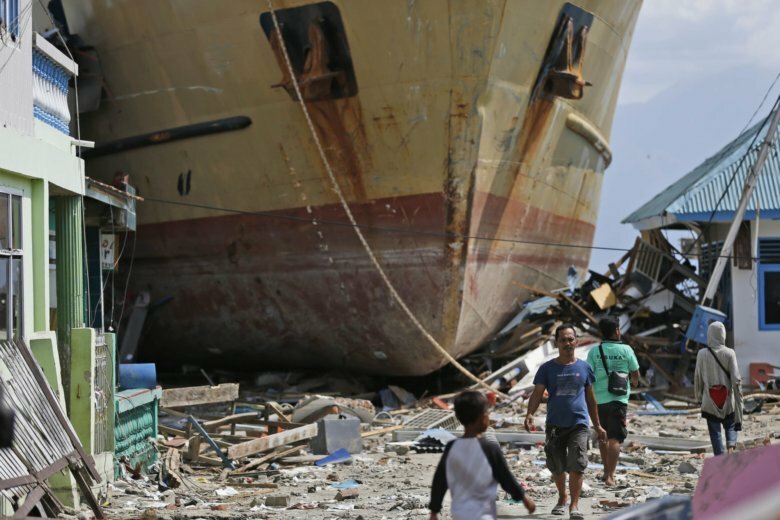 The double disaster that struck the city of Palu and other settlements killed more than 1,550 people, left about 70,000 homeless and wiped away buildings along Sulawesi’s coastline. The city of 380,000 people has experienced days of lost power and water, dry gasoline stations and a slow dribble of aid. The ferry, built in 2014, was docked outside Wani because the state-owned company that owns it was delivering it to a new owner. That was also serendipitous because there were no passengers on the 63-meter (208-foot) -long vessel. Captain Edy Junaidi said the tide retreated about 7 meters (23 feet) immediately after the quake and he thought the tsunami wave was 10-15 meters (33-50 feet) high. Petty officer Imat, who uses one name, said 20 meters (66 feet) and Johanes estimated it at 15-20 meters (50-66 feet). Their accounts exceed the highest estimates of disaster officials, who said the wave could have been 6 meters (20 feet) or higher based on a man who survived by climbing a tree. A tsunami warning issued after the quake predicted waves of up to 3 meters (10 feet). Johanes was in his cabin turning on the TV when the quake hit just after 6 p.m. on Sept. 28. There was “extreme shaking” and the light bulb fell out and the air conditioning unit plunged to the floor, he said. By the time he reached the deck, a huge wave was approaching and the pier had collapsed. In the preceding one to two minutes, the panicked crew had donned lifejackets and released all of the ship’s mooring lines except one — the head line at the front of the ship — which was stretched incredibly tight as the tide rushed out, forcing Imat, the petty officer, to let it go. “There is no doubt as a human being of course I’m panicking,” said Imat. “But we have to realize that this is a natural phenomenon. It’s the will of God and we are chanting God is Great. But without forgetting our position, our duty,” he said. To the crew, the sudden drop in water level was bewildering and it seemed like the Earth was rising. “I saw the ground getting higher and higher. It was so high. Then I saw the pier had collapsed. It was chaotic. I could see a wave, a dark high wave. I cannot imagine that,” said Imat. “The ship was driven all the way back and only then did I realize that it was the water that had gone down,” he said. Johanes, at the bridge when the wave hit, was bracing for a collision with the broken pier. “I was holding on. I thought we were going to be thrown when we hit the pier. Then I just realized we weren’t thrown. We were flying,” he said. At first the crew didn’t realize they’d been dropped on land because the ship remained surrounded by water after being lifted and pushed forward by the surging sea. In retrospect, it was a “smooth” landing and the ship appeared completely undamaged, Imat said. The captain, Junaidi, estimated the ferry now lies about 50 meters (yards) from its original position at the dock. “We all panicked,” said Johanes. “We have a plan to abandon the ship but we are waiting for the captain’s instruction. The captain managed to calm us down,” he said. “If it is necessary we will abandon the ship but at the end the ship didn’t go anywhere. After 30 minutes we saw solid ground around us. We realized it’s not ocean around us. It’s solid ground,” he said, days later still absorbing the ordeal the crew endured. They cracked dark jokes about their experience and seemed content to wait on a vessel that has none of the deprivations of the nearby villages. Associated Press journalist Fadlan Syam contributed to this report.